In 1951 Sir Hugh Beaver, managing director of the Guinness Breweries came up with the idea of publishing a book that could be used to settle bar arguments about world records. The first Guinness Book of Records was published as a giveaway. One thousand copies were printed and given away in 1954. The book was such a surprise success that in 1955 the Book of Records was established as an ongoing enterprise on Fleet Street. The book quickly went on the British bestseller list and remained there for years. It is unknown when the "Most Tattoos" category was added to this book of world records. 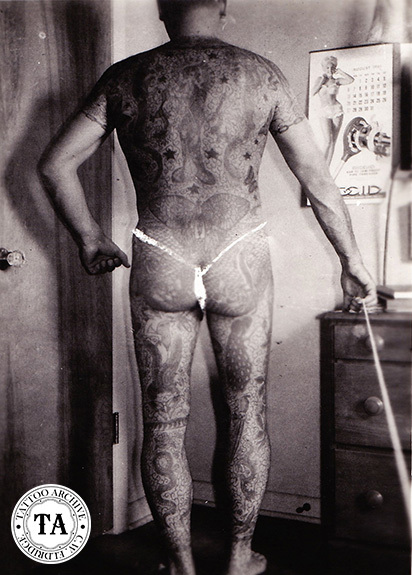 The 1980 version of the Guinness Book of Records featured George Zastrow as the most tattooed living man. The record book described him this way, "George Zastrow of Justice, Illinois, is believed to be the most illustrious example of the art living now." They went of to say, "his body suit had 130 individual designs with extensive scrollwork." Before George Zastrow, "Sailor Joe" Simmons held the record for most tattoos with 4,831 designs. Although the number of Zastrow's tattoos did not measure up to that count, nevertheless Zastrow's coverage was extensive. Only his face, hands and lower arms were left untattooed. Ray Youngman was a young tattoo artist living in the Chicago area. It was there that he met George Zastrow who worked for a Chicago newspaper. Zastrow had been getting tattooed for many years in the area, and by the time they met, Zastrow already had much of his famous body suit. His tattoos were done by some of the greatest names in that area including Tatts Thomas, Amund Dietzel, Phil Sparrow, Ralph Johnstone, Milton Zeis, Doc King, Greg May, Jungle Jim and Magic Mike. Zastrow befriended Youngman and was a big influence on him and his budding tattoo career. Zastrow was a hobby tattooist and did some of his own tattoos. He had equipment from Milton Zeis. As well, he collected tattoo photographs that he shared with Ray. In a recent interview Ray stated that George Zastrow was like a father to him. 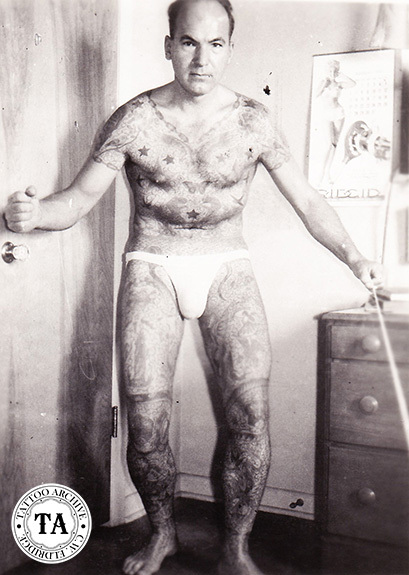 Thanks to Ray Youngman's biological father, Ray was exposed to professional tattooing at a very young age. Ray met Jack Armstrong when he was only 12 years old. I guess it went full circle with George and Ray, because as Ray perused tattooing and he did some of George Zastrow's tattoos. 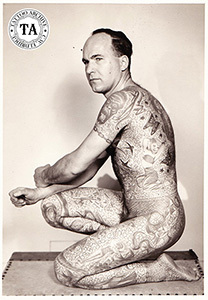 It is unclear how long George Zastrow held the Guinness record but the 1985 edition of the Guinness Book of Records saw an expanded tattoo listing. Now there were two men featured, Wilfred Hardy as having the most coverage to within 4% on his body and Walter "Stiggy" Stiglitz as having the most designs with 5,432. Included with this article are four of the Bernard Kobel photographs showing George Zastrow's tattooing.